When planning for server consolidation, many make the mistake of reinstalling their production systems from scratch into the virtual environment. Then attempt to replicate the many configuration changes and previously applied patches necessary to get the system to match the current physical system. This method can be very time consuming and prone to error. With Storix System Backup Administrator (SBAdmin), you can create a provisionable backup of the entire system, and reinstall into your virtual environment. SBAdmin provides Adaptable System Recovery (ASR), which records your AIX, Linux, or Solaris system configuration in the backup, then compares that with your newly detected virtual environment and adapts to any change. 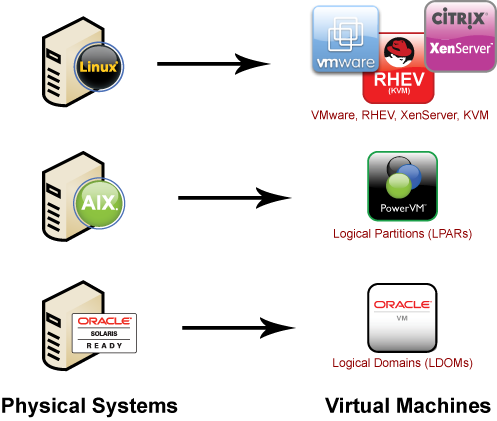 Migrating AIX systems to LPARS, Solaris to LDOMs or VirtualBox, Linux systems to VMware, KVM or XenServer has never been easier. Virtualization vendors will hail the benefits of moving from physical to virtualized systems. However, most fail to leave out the fact that once a system has been virtualized using their products, it is very difficult to change to a different vendor or move back to physical hardware. Now that you are under contract, you are essentially “locked in” to a virtualization vendor. Just as easily as SBAdmin can move your production system from physical to virtual (P2V), the same process of Adaptable System Recovery (ASR), can be used to migrate back to physical hardware (V2P) or to a different virtualization technology (V2V). With SBAdmin, you can be sure that your systems are not only backed up in case of disaster, but can be re-deployed onto most virtualization technologies or back to physical hardware if necessary.